This week I finished the Turquoise Scraps top for my older daughter’s new birthday quilt. It’s a lap quilt and measures 55 inches square. The inspiration for this quilt came from several sources. The basic block is the Stash Buster by Buttonberry, which I made half-size. The free pattern for the original size block is here (Link Updated 30-8-11). I wanted to use crisp and neat white sashings because I love the look of this 9-patch quilt by Crazy Mom Quilts. I also like to use cornerstones because they work like registration marks to keep the rows nice and straight. I learned this technique through making some of Judy Laquidara’s patterns, and the idea for this particular setting came from this photo at All People Quilt. The backing is already finished, as well. I used Mary Johnson’s instructions for piecing an Off Center 4-Patch Backing, and happily I had some compatible fabrics in my stash! The only things I had to buy for this quilt were the batting and one light turquoise print for contrast. What a beautiful quilt! Turquoise is such a lovely color; but it is often hard to find in fabric. Congratulations! And turquiose makes me think of quiet summer skies. very pretty quilt! 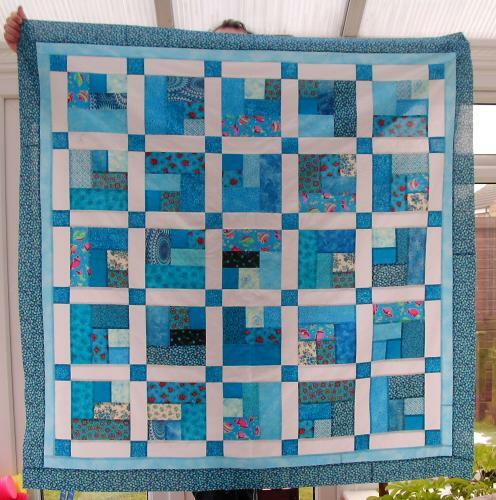 i love the dimention factor added into the quilt in the form of the lovely white lattice and turquoise cornerposts. almost like looking thru a fence at a stained glass window! on February 28, 2010 at 2:35 pm | Reply Kathie L.
beautiful, love the way it turned out. I use cornerstones for the same reasons, love the look and make it easier to piece and keep straight and square. Turquoise is my favorite color! 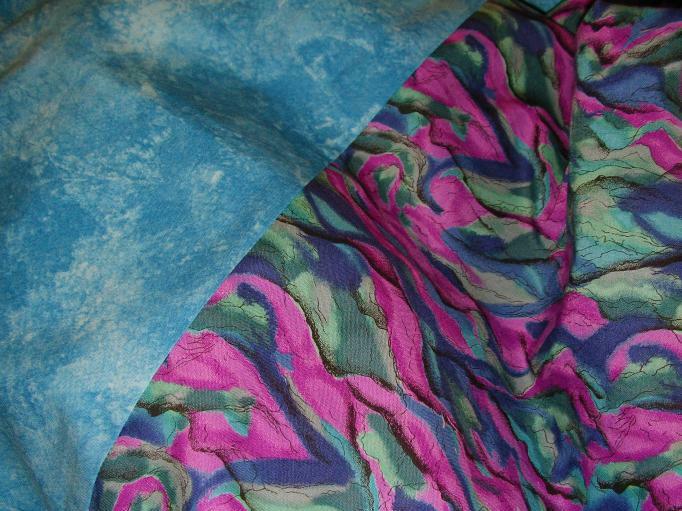 When I was a little girl my Mom always made my clothes out of turquoise fabric! (and I shop for turquoise clothes at my age (60+). I would be pleased to give this quilt a home!!!! I am sure it will be a great birthday gift and she will love it. Thanks for sharing this with us!!! Hi Dianne – this is really beautiful, such a gorgeous fresh colour scheme. Love it ! I use cornerstones for the same reason – much easier to get that sashing nice and straight. The quilt looks lovely and I’m sure she’ll love it.